Standing over a hill with breathtaking views of the world renowned city of San Miguel de Allende and it’s dam, surrounded by grape vines and olive trees; and conveniently located less than 8.5 km from the city centre, on kilometer 10.2 of the nuevo libramiento San Miguel, Guanajuato; is where it was possible to fulfill this ambitious project which started from scratch in 2010. We are known for being the most exclusive and beautiful wine estate in the area, where you can celebrate the wedding or event of your dreams, delight your palate with delicious dishes in our Restaurant Lavista or simply enjoy a guided tour of our vineyards and winery ending with a tasting of our 100% Mexican wines! San Miguel de Allende, ground zero for the Mexican independence, has positioned itself worldwide as a small cosmopolitan city; known for its friendly people, art, culture, security and pleasant climate, within an exponential framework of colonial architecture; it is no wonder that for the 2nd year in a row it has been named Best City in the World by Travel + Leisure and World Heritage site by UNESCO. Revisiting previously used techniques and materials in construction of haciendas, vaults and adobe become the star child of this majestic edification which rescues several architectural principles, putting to the test the null use of structural elements and solid walls over 50cm wide that bring back to life the essence of Mexican colonial architecture, generating an atmosphere of total tradition. Materials and details were used, which gave it a modern touch but at the same time they aged with dignity every one of it’s spaces so that every detail, managed to give that feeling of being at home, with modern facilities in all spaces and the best amenities. Designed with romantics in mind who would like to marry in this ambience, the hacienda has a charming chapel surrounded by a lake and gardens with an exceptional view of the vineyards. Fourteen suites divided between the Main House and the Guest House; each one with amazing views of the lake and the vineyards, together with all the comforts make for the perfect scenario to lodge both families and spend an unforgettable weekend. The rooms, interior courtyards, game room, cellar and terraces together with the objects, pieces of art and furniture collected over many years for the project recreate the charm of an old hacienda with the comfort of modern life. 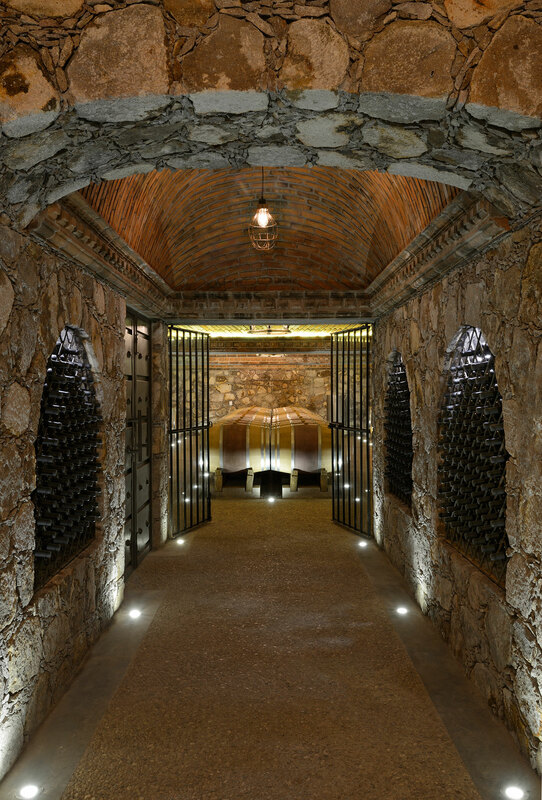 Without a doubt, each space of the more than 10 hectares that make up the Hacienda San José Lavista, the Lavista Restaurant, it’s winery and vineyards, are the perfect combination of technology, comfort, good taste and great architectural work. Generating the perfect setting to spend a dream day.